On any given day, most advanced manufacturers apply Lean principles into managing production and manufacturing initiatives. However, Lean practices can also be applied towards administrative processes. 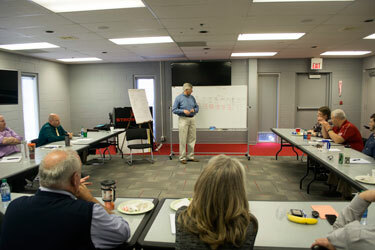 Sixteen employees from Strongwell’s estimation group recently underwent a Lean in the Office training session led by Nelson Teed, Executive Director of the Manufacturing Technology Center in Wytheville. Since the early nineties, the Manufacturing Technology Center has been helping industries in southwest Virginia. The half-day Lean in the Office seminar offered abbreviated versions of Define, Measure, Analyze, Improve and Control (DMAIC) exercises Value Stream Mapping activities. Strongwell participants were required to identify value streams in both customer and product forms. The group as a whole was then able to complete a visual map of the current value stream and compare it to a possible future state. The future state model identified methods to reduce extra processing while delivering qualitative results for the end users of Strongwell materials. In addition, the group as a whole worked together to identify strategies to create the most value while consuming the fewest resources. After the completion of the training seminar, the feedback received was that inefficiencies within administration are less distinguishable than in manufacturing, but nonetheless are targets to be improved upon. Upon completion of these value streams, the suggested improvements were assigned to a value stream manager who is responsible for implementing these standards. Many thanks to Randy Montgomery (Industrial Products Manager-Bristol) and Melissa Harrison (Chief Estimator- Bristol) for their efforts to improve the administration processes of fabrication and estimation through opportunities for continuous learning.